Students are offered the opportunity to join the following clubs and organizations as their interest and time permits. New clubs are created regularly as interest and resources allow. Bricks for Kidz: Bricks 4 Kidz classes provide a fun class where students learn, build, and play… with LEGO® Bricks. This is a fee-based class where students in grades K to 5 can sign up for a month long session. Bricks for Kidz meets on FRIDAYS at 3:15 to 4:15. 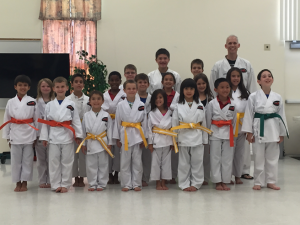 Karate is open for students in grades K to 6. It is a fee based class where students learn the foundation of Karate. Karate meets on Thursdays from 3:15 to 4:15, except on early release days when they will meet at 1:15 to 2:15. Resurrection Catholic School Mass Choir meets on Mondays at 3:15 to 4:15. Students practice songs to sing for Mass and choir is open to children in grades 3 to 8. Resurrection Catholic School Bell Chimes meets on 2nd and 4th Thursdays from 3:15-4:15. Bell Chimes are open to students in grades 4-8. Resurrection Catholic School World Music Ensemble meets on 1st and 3rd Thursdays from 3:15-4:15 and is open to student in grades 4-8. Resurrection Catholic School Band is open to students in grades 4 to 8. Band practices on Wednesdays from 3:15-4:15. Drama Club is open to students in 7th and 8th grades who have chosen the Drama Encore elective class. Meetings are held twice a week after school. Spirit Squad is offered as an Intramural Sport as part of the Athletic Department. It is open to boys & girls in Grades 3-5. Fall Season begins September 12 – the end of December. Practice is held every Monday from 3:30-4:30 in the Sheedy Center. BETA Club meets on the 2nd Monday of the month at lunch. It is open to 6th grade students who have academically been invited to join BETA. Mrs. Waller is the moderator. Student Government meets on the 3rd Tuesday of the month beginning in September after school. Mrs. Hicks is the moderator. Middle School Chess Club meets on each early dismissal day at 1:00-2:30 in the middle school. They will be competing in tournaments monthly with Polk Scholastic Chess. NJAHS meets on the first Friday of the month (lunch meetings) and every Tuesday after school in the Art Room for creating from 3:30-4:30. CoderGals will meet on Tuesday from 3:15-4:15 adn is open to girls in grades 3, 4, and 5. CoderGals is an organization where female high school mentors teach elementary school girls how to code through free after school workshops. CoderGals’ mission is to spark young rigls’ interests in coding through fun, creative, and collaborative projects. The projects are designed to demonstrate that code can be used to build anything that a girl can imagine- from games to fashion to robots. RCS Alumni, Gabriela Nadeau is the sponsor. MathCounts is open to qualified middle school students to compete in the regional Math competition. This group is for the Math minded! A-Team is open to qualified students in Grades 5-8 to compete in an academic quiz bowl in the Spring. Practices will be scheduled in the Fall. Snack Shack is a middle school peer tutoring session which meets after school on most Wednesdays until 4:30. Book Club is available for Grades 3-5. Students will be responsible for obtaining the assigned book and reading on their own time. Book Cub will meet on the 2nd Thursday of each month to discuss the book and enjoy light refreshments. $10 yearly fee.